Away from the new iPhone models there have been months of speculation on what Apple is planning next for its new range of tablet PCs, and now the company has confirmed the launch date where we should see the iPad 5 and iPad mini 2. 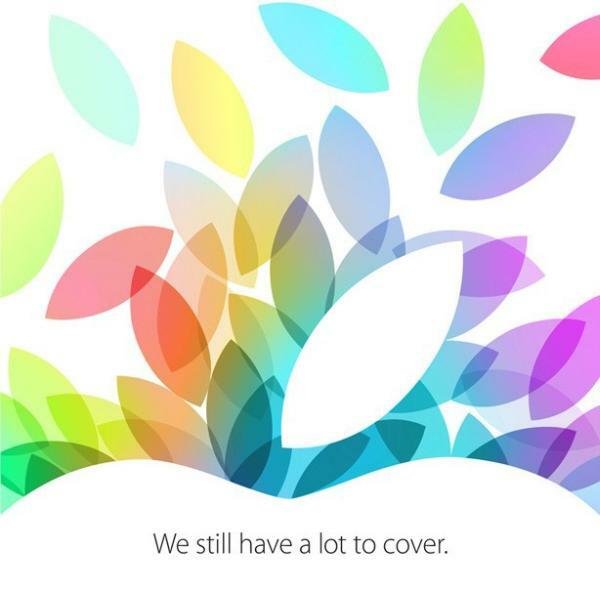 As we predicted previously Apple has now sent out invites for an event a week today on, October 22nd with the statement “We still have a lot to cover”. Without giving much else away the event is expected to showcase the iPad 5 and iPad mini 2, and the colourful invitation hints at the possibility that the new iPad devices will have more colour choice as was seen with the latest iPhone 5S and iPhone 5C. The event is being held at the Yerba Buena Center for the Arts in San Francisco, California and is set to kick off at 10am Pacific or 1Pm Eastern which will be 6PM in the UK. Apple normally waits to exactly one week until an event before sending out invites to the press. Apple is believed to be bringing a redesigned iPad 5 that will borrow some of the design features from the iPad mini with a slimmer profile and smaller bezels around the display while also being more lightweight. There has been a lot of speculation regarding the iPad mini 2 with recent reports suggesting the highly demanded device won’t feature a Retina display, and instead will only come with an improved processor and camera, but we are only a week away now before the world finds out officially. Will you get a new iPad this year? when ipad mini 2 will be available in UK after it launched! ?